MasonrySaver VOC Compliant Solvent Base Water Repellent - Clear, voc compliant brick waterproofing sealer, stone sealer, and oil based driveway sealer. Note: This is a VOC Compliant product. 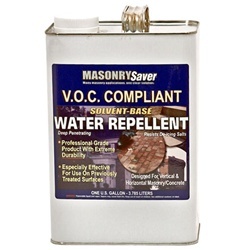 The VOC content is less than 400 grams per liter and it can be sold in states that have adopted the California OTC standards..
MasonrySaver® VOC Compliant Solvent Base Water Repellent is an effective, penetrating water repellent in a mineral spirits carrier designed to protect above-grade masonry surfaces. It is designed to penetrate deeply in to most masonry and concrete pores and can be used as a clear sealant for brick and cement patios, a driveway sealer to water proof concrete, or other vertical and horizontal masonry surfaces. This VOC compliant silane/siloxane product comes with a 7 year warranty when applied to vertical surfaces. It can be used to retreat previously waterproofed surfaces as well. With its mineral spirits base, VOC Compliant Solvent Base Water Repellent is an ideal maintenance product for previously treated surfaces as the mineral spirits carrier will allow the product to bond with surfaces that have previously been waterproofed. It can also be applied over siliconized acrylic concrete stains. So far, the states that have adopted these new standards include California, Connecticut, Delaware, Illinois, Washington D.C., Maine, Massachusetts, New Hampshire, New Jersey, New York, Ohio, Pennsylvania, Rhode Island, Vermont and Virginia (only in the counties of Arlington, Fairfax, Prince William, Stafford and Loudon). 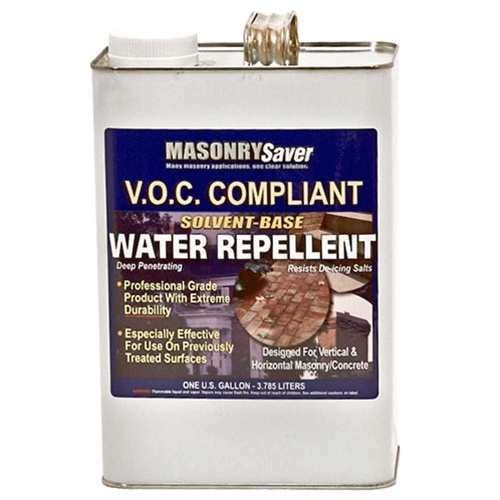 MasonrySaver VOC Compliant Solvent-Base Water Repellent can be used on most vertical or horizontal exterior, above-grade masonry surfaces including: Adobe; Architectural concrete, precast or cast-in-place; Clay Brick; Mortars; Natural Stone; Limestone; Granite; Sandstone; Terra Cotta; Exposed Aggregate Products; Portland Cement Stuccos and Concrete Masonry Units. It is an ideal maintenance product for previously treated surfaces. It can be applied over siliconized acrylic concrete stains. Natural substrate color and surface textures are unaffected, with little or no gloss created, however, overapplication can cause substrate darkening. Slight darkening may occur on some adobe, limestone, or very dense surfaces. Testing is recommended before treating any surface to ensure desired results. Surfaces treated with MasonrySaver VOC Compliant Solvent-Base Water Repellent may be painted with many oil-base paints. Testing is always necessary to ensure adhesion and compatibility. Note: Painting over MasonrySaver VOC Compliant Solvent-Base Water Repellent substantially reduces the vapor permeability of the product.